Right Hand Gold software is very useful product for person, who has concern with many people in day to day work and has to keep record of all of them. Right Hand has address book in which you can maintain the record of the people along with phone calling option. Right Hand Gold also has English to Gujarati and Hindi conversation. It has reminder and task manager facility along with phone book and Diary to maintain each day record. ...... Right Hand has address book in which you can maintain the record of the people along with phone calling option. Right Hand Gold also has English to Gujarati and Hindi conversation. It has reminder and task manager facility along with phone book and Diary to maintain each day record. 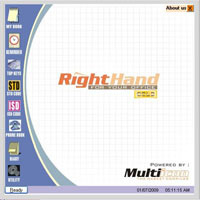 Right Hand software has a huge list of features which are listed as below. English to Gujarati & Hindi Converter. Phone Book & Mailing Label Printing. Store and organise all bits of different information in a single place. Ebook Reseller Rights to over 5 brand new products at one low price! Qweas is providing links to Right Hand Gold as a courtesy, and makes no representations regarding Right Hand or any other applications or any information related thereto. Any questions, complaints or claims regarding this application Right Hand Gold must be directed to the appropriate software vendor. You may click the publisher link of Right Hand on the top of this page to get more details about the vendor.